My novel “Soulmate” focuses on love, lust and psychology! It gets into the mind of the main character, Tillie, as she experiences the highs and lows of her life, when trying to find her "Soulmate" and all that this has taught her; Lessons about ‘selling your soul, lesson on false flattery, betrayal, injustice, deceit and the hardest lesson of all, the lesson of love; Was Pluto right do we only ever have one “Soulmate”?……. So what did I discover about the lesson on ‘Selling your soul’? It is often said that we, inadvertently or sometimes deliberately ‘sell our soul to the devil’ but what does this mean? According to traditional this was the pact between a person and Satan, the devil, or any other demon for that matter when a person offers his or her soul in exchange for diabolical favours. Such tradition it is said is where those favours vary, but tend to include youth, knowledge, wealth, or power. It was also said that some people made this type of pact just as a sign of recognizing the devil as their master. Likewise when lovers believe that they have found their ‘soulmate’ all too often one partner becomes the ‘master’. The master is the person that quietly and skillfully manages to take control over the others life; leaving the other person feeling trapped. Regardless, of whether this person has or has not really sold their soul to the devil the position they find themselves in is an uncomfortable and dangerous one. 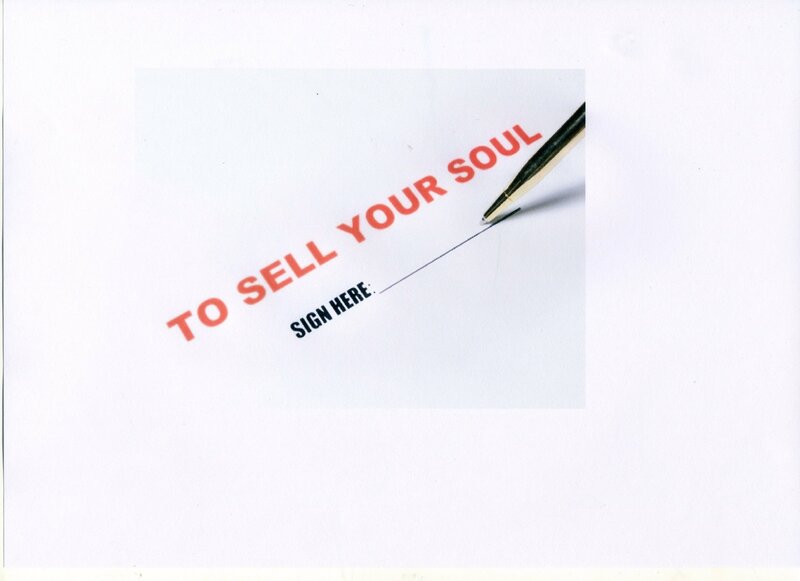 People that use the phrase ‘‘selling your soul to the devil’ will often say that they believe in the afterlife, as many people do; however believing in the devil, now that is another matter entirely. One many people find a little silly. When you ‘sell your soul’, to the devil or not, you begin racking up a type of human debt that must be paid back, not necessarily with money, but to be paid back in some way. This is because you have become indebted to somebody, this person may have got you out of a bad situation, leant you money, or done you a huge favour in some way. Numerous people will undoubtedly say that this would be too high a price to pay; to owe another person in this way. To be beholden to another human being is most certainly a big price to pay and a large cross to bear. Selling your soul can result in hellish experiences as many people who have embarked on such a route have found out to their cost. 1)	What is the real reason you are even considering it, wealth, fame or power? 2)	Is the eventual price really worth it? 3)	Will the outcome (the price) scorched itself into your brain like a soldering iron, never to be forgotten? Oh yes there are occasions when at first glance the rewards for ‘selling your soul’ may appear very sweet and therefore attractive. But do you proceed ask yourself if you really want to live like this, and above all remember that nothing in life is free, ‘what goes around, comes around’……..Choose your path wisely. Have you ever been tempted to ‘sell your soul’?